(I take NO credit for the originality of this post or the gifs contained herein. Please see here for the original I have shamelessly ripped). footnote I have read all of these books. I have even posted a review or two. I do not deny that these books have an appeal to a certain audience, they just aren’t for me. Book recommendations are very tricky things. It can go oh so very wrong. So very, very wrong. Which is why there are very few people (three) whose opinion I trust wholeheartedly. We are on the same book wavelength, if you will, and I know if they tell me a book is good, it will be. To work properly, reviews and recommendations need trust between the parties. Need experience. A shared reading history. That bizarre alchemy of taste and preference. Appearences to the contrary, I am pretty picky with what I read. I’ll try most things once, but it takes quite a bit to turn me into a fan of a book/author and willing to reread a title, and even more to make me tell people about it. It is not a hard and fast rule, but I will only write a review/tell people about a book if it is 1) so awful they must avoid at all costs or 2) so brilliant they MUST READ IT NOW. Often, if a book is in category 2, I will go so far as to buy copies as gifts, or thrust them at unsuspecting acquaintences. Which brings me to twitter recommendations and the hype that often surrounds new releases. Simply, I ignore pretty much all of it. Most of the recommendations and reviews are from people I don’t know. Have been, most likely, prompted by hard working marketing/publicity people. How do I know I will like what they will like? I don’t frequent book review sites and blogs, so I haven’t built up a track record with any of these people. It is just not the way I work. I digress. What you need to take from the ramble above is that I am very skeptical about most reviews and recommendations I hear. And that when I tell you about a book, I am genuinely enthused. There was something about what I was hearing about the following book that caught my eye. One blogger who I pretty much trust raved about it. Then editors who I trust professionally and who I like personally started in. And then some authors who I again respect (adult authors as well, not just YA, indicating good crossover appeal) said they’d enjoyed it. And I started to listen. Working in the industry as long as I have has given me a pretty healthy disrespect for most promotional links and hype. Getting the word out about a book is one thing. Getting that word self-perpetuating and growing is a whole different kettle of fish. Crossing over to get the attention and reviews of people who read for a living, so don’t have time to read bad books for enjoyment, is just… Rare. And made me take a chance. Not enough of a chance to buy a copy, but enough to reserve it at the library. (And the decently long waiting list there was also a good sign). Which brings me, at last, to the book. 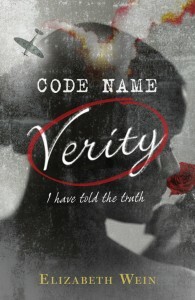 “Code Name Verity” by Elizabeth Wein, published by the good people at Electric Monkey Books. I picked the book up Sunday morning, and with only two breaks for more tea and an episode of Big Bang Theory to decompress in the middle, I finished it by Sunday dinner time. A feat accompanyied by floods of tears. I don’t want to give the book away but it is gripping, harrowing, moving, thrilling, fascinating (I already knew most of the history, but it is lain out so beautifully), and heart breaking. And uplifiting. Possible to read on many levels, from a simple adventure story set among the airfields and espionage games of WWII, to an exploration of friendship, early feminism, loss, the terrors of war, the depths – and heights – humans are capable of. It is all there. There are a few bits I might have done a little differently, but they are teeny. On a reread there may be more bits which catch my attention, but again – they do not detract from an amazing book. The characters will live with me for a long while yet. I applaud Elizabeth Wein for not taking an easy, or obvious, way out of the various situations. The various reveals of crucial plot points are well done. Possibly not the most sophisticated, but you have to remember this is not a John Le Carre spy novel here. Plus, most audiences – especially the target one! – won’t be as hyper critical as me, so my tiny niggles are just that. Tiny niggles, and fun things I hope to discuss in great depth with people. This is a book I would have given my left arm to have crossed my desk when that was part of my job. This would have been me. I don’t often cry at books (films are another matter), but this one had me sobbing and drenching more than a few tissues. And smiling. Sometimes at the same time. All in all a good book. Go, read it. And tell me what you thought – y’all should know by now that there are few things I love more than a good argument discussion about a book. P.S. It turns out, when I got to the end of the book, that the author has had worked picked up by Sharyn November. This is actually not a surprise. I wrote most of this sitting on the train into London, whilst zooming across the country to spend the afternoon celebrating my brother’s birthday with a BBQ. Yes, we British are trying a BBQ on a May weekend – you wondered why the weather had taken a turn for the worse? How am I writing a post if I am on a train? One of the multitude of notebooks I own? The PocketCalculator hauled out for a trip? Neither. I am typing this (with a few typos!) on my teeny-tiny new netbook, an Acer Aspire One with a 9” screen, 16GB solid state HD and running Ubuntu Linux. I LOVE my MiniMe! It is just so, so… Dinky, to nick someone elses term. Plus it does all I need it to. Before I start my review properly, I should outline what prompted my decision to get a netbook/ultra-portable. I have taken to doing writing during my lunch break at work, as I just never seem to get around to it in the evening. For a while I was taking in the PocketCalculator, but I never felt comfortable- it was heavy to lug around, and I was acutely aware that, if it broke or got nicked, I would need to shell out near one and a half grand to replace it. I just can’t afford that. So I started to think about netbooks. Really, really light and portable machines I could just use for writing. I wanted to avoid Windows if at all possible and all that lugging around made the thought of a solid-state hard drive appealing. Which is where a recent trip back to Somerset came in very handy indeeed. Taunton is blessed with a Comet, a Curry’s, a Staples and a PCWorld all in a row. All four the main suppliers of computing technology offline. Result. I wandered around, played, asked questions, pondered, and at the end of an hour, the Acer Aspire One was the only (and best) choice. It had a solid state option. Check. The keyboard didn’t feel too bendy when typed on. Check. The screen was crystal clear, far more clear in fact than my PocketCalculator. Check. It came in a colour other than black (blue). Check. It had WiFI and a good smattering of ports (3x USB, screen, headphone, mic, sd/microsd/etc). Check. It was light and had an approximately 3 hour battery life. Check. The trackpad was really, really responsive. Check. It was the cheapest of the lot. Result! So does it do all I want it to? How has the first few weeks with the MiniMe gone? I love it. I adore it. I wouldn’t trade it for the world. I should point out, I have ONLY been using it for writing. I have yet to connect it to the Net, but it has done everything else so well I can only imagine that it would do that perfectly too – after all, that is what it was designed for. You boot it up and are greeted with a customized homescreen divided into CONNECT (Mail, Firefox, address book, Messenger, RSS reader and more), WORK (the OpenOffice suite, of which the Word-clone behaves almost identically to a stripped down Microsoft Word), FUN (lots of games, but the demo versions are all crippled so tend to stop after a certain number of moves. Annoying. You can upgrade to the full versions, but they cost and I am trying to keep the distraction down) and FILES (self explanatory). You then navigate to what you want to do et voila. It’s not as speedy as modern PCs, but then what can you expect from a stripped down processor and Flash storage? It is perfectly fast enough if you get over the desire for instantanteous programme opening. The screen works well in bright environments (e.g., on a train with the sun streaming through the window), but I’ve yet to try it outside on a bright, sunny day. I’ll update when I have had the joy of writing in the park. The keyboard is perfectly responsive, if a little ‘clicky’. The spacebar doesn’t always trigger, but that is more down to getting used to the much smaller footprint of the keyboard. Your early typing WILL look like a brain-injured spider has tap danced on the keyboard, but I adapted pretty rapidly. Here’s a tip if you are in OpenOffice and it is refusing the UK localisation of your keyboard, despite what the global settings might be: go to TOOLS > OPTIONS > LANGUAGE SETTINGS > LANGUAGE, and in the LOCAL option, choose English (UK). Your keys will behave as they should do once more. It’s amazing what you pick up whilst BBQing a cows-worth of steak at your brother’s 30th party. Yes, my brother is now 30. Holy crap, that means I am 27 this year. That’s “late twenties” territory… Eeek. The trackpad is hyper sensitive, and it is very easy to accidentally brush it with your thumb and *bam* you’re suddenly typing in the middle of the paragraph above. Another foible is the page up/page down keys, right next to the arrow keys and under the right hand shift. It is very, VERY easy to trigger these by mistake and again, *bam* your cursor plays a game of “where’s wally?” I’m not the only AspireOne user to note this either, but it’s just a case of getting used to it, and being careful where you place your fingers. What else? I got a LapJack sticker to cover the lid and give it some protection – the lid shows fingermarks just as soon as you look at it. The Acer is a common enough machine that most sticker websites have a template for it. There are also several different cases on the market if you want to give your baby a little more protection when you hurl it in your bag. But in the end, what is my verdict on the machine? That’s easy – I love it, I adore it, it is my writing soulmate! So there are a few niggles, but they are tiny, teeny niggles. It does exactly what I want it to do, no more, no less, and I didn’t have to read a 500 page manual before I could set it up. What else can you ask from a piece of technology in this day and age? I first read Jamaica Inn when I was 11 or 12. The precious brat I was, I had finished the book the rest of the English class were reading, so Mr Priestley suggested I read this one while everyone else caught up. I remember enjoying it and I also remember bits freaking me out, but that’s it, so when I saw a copy in a charity shop, I figured it was time to revisit the book. It is a lot darker the second time around and, when read with adult eyes, the treatment Joss Merlyn gives to Aunt Patience is even harder to swallow. The darkest bit of the book comes in the middle, where you realise along with Mary quite how trapped and helpless to the situation she is. I was eager to get to the end, but forced myself to fully appreciate the plotting which is as tight as a drum. Not for a second does du Maurier let up with the gothic horror on the windswept Cornish coast. The half-remembered plot had me going “don’t trust him!” to Mary a few pages before the secret villain is revealed (ooh, how that shocked me the first time round). The one bit that slightly annoyed me is the ending and Mary’s fate. Not to give it away, but for such a strong female character, I’m rather disappointed at the way she chose to end things. Would I recommend Jamaica Inn? Definitely! I loved this book the first time around and I loved it when I read it again over a decade later. I definitely took more from it the second time around. Some books you read and can’t understand why they’ve become “classics”, but Jamaica Inn isn’t one of those. As the shambling zombie masses cover the globe, advanced nations quickly succumb to the feeding frenzy. Complacent first-world citizens are no match for the mindless, fearless undead. Civilization’s only hope rests in war zones like Somalia, where fighting for survival is the norm. From this quarter emerges an unlikely group of heroes. A small army of girl warriors are crossing the world to find the supplies necessary for their survival. They are guided by Dekalb, a former UN inspector, chosen for his knowledge of America. The zombie plague has taken out this once-powerful nation, and the insatiable undead now fill the streets of New York City. One amongst them is different. Though driven by the same hunger, his mind is alive, and he’s discovering the advantages this difference can bring. Dekalb will soon learn that if there’s anything more dangerous than a flesh-hungry zombie, it’s one with a plan. Dig a little deeper on the web and it turns out that Monster Island was first written as a serial novel in blog-format. This shows in the writing from the start, where the chapters are short, as are the sentences. The action starts from the first page, as the Statue of Liberty looms through the fog, and it continues pretty much unabated till the final page. It’s clearly written to be read on the web and on the screen, grabbing your attention and never straying too far from the styalistic path. It would be rather two-faced of me, a blogger, to take issue with this style, so I’m not going to take issue with it. Apart from the fact I don’t like how it translates to the printed page and book-form. The book grated on me pretty quickly and kept grating upto the last page. I found the flat two POV narration irritating, with the constant flip-flopping between Dekalb and Gary jarring. All the time as I was reading and jumping from one crisis to the next I had a niggling desire in the back of my mind for more flesh on the narrative bone. Give me some characterisation, I pleaded. A plot-twist you don’t see coming from the first page. A chapter longer than seven sides – yes, I counted. The longest is the final chapter which wraps everything up, and even that’s only eight sides long. Perhaps I’m jealous? Brevity is a technique I’ve never mastered and it does have it’s place, but to me the constant flipping between narrative voices and action simply meant I never fully got into the story. It read like a modern music video: styalistic, dramatically shot and fast cut; all flashing lights and swooping camera angles, with scantily clad beauties and a thomping tune to distract you from the lack of content. Still, I enjoyed it. I loved the concept of intelligent zombies. The most convincing section of the book was the section which detailed (all to briefly) the spiraling collapse of civilization. Moments of brilliance shone through the book and one of the main supporting cast, Ayaan the gun-toting school girl, was touchingly drawn. It kept me entertained through two hours of having my hair cut/coloured. I wanted to get to the end to find out what happened (I’d guessed correctly). I even felt a little sad that I had reached the end and that certain characters met the fate that they did. Would I recommend Monster Island? Probably not. It’s telling that there are two other books in the sequence (Monster Nation and Monster Planet) and that I don’t want to read either of them. It’s also telling that I’m probably not going to pick the book up again any time soon for a re-read. I don’t begrudge the money I spent on the book exactly, but looking back I’d rather have read it in it’s free form off the web. Two mugs of tea and a biscuit – bits of the book were good and I appreciate it for the authors experimentation with the free-web/pay-print model, but on the whole I think I’ll give the zombie genre a miss for a while. Shuffling undead work on the screen but it takes a better author than Wellington to make them scary on the page. Time to review a book I think. That last – Puffin – is a bit of a flag. Puffin is the childrens/young adult imprint of Penguin so if you’re an adult-book-snob, this won’t be for you. As I’ve already said, Puffin books are aimed at the younger end of the market and I’d probably pitch Just Listen to the 15+ girl market, give or take a few years depending on maturity. The writing isn’t so simplistic or childish as to put adult readers off, but it has been pitched to its intended audience and you might find it takes a little while to get used to the style. From the blurb it’s fairly self explanatory that this book wants to give you a view from the other side, a sneak-peak into the life of the popular girl. To be totally frank, this immediately set my back up and set me out to loathe the book from the start – the ‘popular’ girls made my life unmitigated hell at school, so why would I want to read about them for fun!? Even ten years on, empathy is a bit much to ask for. The opening of the book didn’t exactly endear itself to me either. Far too much scene setting and overly conscious ambiguity. Oooh, look, little miss popular has a secret and her life isn’t so great after all! I got all that from the blurb. But I stuck to it because, well, I was curious as to what exactly had happened to bring about Annabel’s fall from grace, and I’m glad I did. Somewhere about chapter three or four I found I was getting caught up in the story and I didn’t put the book down till I’d finished it with a lump in my throat at three in the morning. Personally, I’d have stopped the book one chapter earlier but I can appreciate why the author felt the need to wrap all the loose ends up with a pretty bow. I never totally warmed to Annabel and the villain(s) of the piece lack any subtlety of character, but the supporting cast are total gems. If anything, the middle sister, Whitney, made the book for me and I’d willingly read more about her. As for the plot, yes it is a little predictable in the grand sweep, but I will admit to being knocked by the main plot revelation. Either kids books have got a LOT darker lately, or my own segue to sci-fi/fantasy in my early teens spared me some fairly gruesome YA fiction! Would I recommend Just Listen? For the intended audience: yes, though a qualified yes. I might be being overly prudish, but I’d suggest that parents of younger teens read page 263 to 265 first, if only so they can be prepared for questions that might arise. For older readers: maybe. It depends on your own personal taste and tolerance for highschool girls and all their neuroses. I enjoyed it but I’m not convinced I want to read it again. (More about the rating system used can be found on the about page). Just saw In Her Shoes and it had me blubbing like a little baby by the end. I am so pathetic. A nice, predictable, well done film. Three and a half penguins.